Researchers at Missouri S&T have discovered a new way to harness the potential of a type of spontaneously oxidized MXene thin films, to create nanocomposites that could sense both light and the environment. Previously, such spontaneous oxidation was considered detrimental because it degrades the MXene structure. The research is published in the June 2018 issue of ACS Nano, one of Google Scholar's top-rated, peer-reviewed scientific journals. "Now we've demonstrated that partial spontaneous oxidation of MXenes into titanium oxide that is integrated with the MXene flakes, can be harnessed to inexpensively manufacture useful MXene-titania nanocomposites," says Dr. Vadym Mochalin, associate professor of chemistry at Missouri University of Science and Technology and principal investigator of the research. "With the exponential increase in MXenes' research over the past several years, conceptual discoveries are becoming less frequent," says Mochalin. "In parallel, researchers delve deeper into MXenes' fundamental properties, in particular, the complicated chemistry of these materials." MXenes are two-dimensional inorganic compounds that consist of a few atoms-thick layers of metal carbides and nitrides that possess high electrical conductivity along with hydrophilicity, non-linear optical and tunable electronic properties. As metallic conductors, they should not produce a photocurrent within the material when exposed to light, as do typical semiconductors such as silicon. However, in their June paper, "Environment-Sensitive Photoresponse of Spontaneously Partially Oxidized Ti3C2 MXene Thin Films" co-authored by Mochalin and Dr. Sergii Chertopalov, a post-doctoral researcher in Mochalin's group, the authors measured a photocurrent through the samples when the partially oxidized thin Ti3C2 MXene films were irradiated with ultraviolet (UV) light. "Materials scientists know titanium oxide as a photoresponsive semiconductor material for many applications—including photocatalysis, environment remediation and sensing—but its fabrication in the form of nanocrystals or nanofilms is expensive," says Chertopalov. "Spontaneous oxidation is now demonstrated as a simple, inexpensive method to fabricate MXene-semiconductor transparent nanocomposite films for applications in UV photodetectors, photoresistors, sensors, and other devices whose electrical resistivity is responsive to UV radiation and changes depending on the molecules present in the environment." "When exposed to an ambient air, containing oxygen and atmospheric water vapor, the spontaneous oxidation of the titanium-based MXenes causes titanium oxide to form on the surface of MXene. 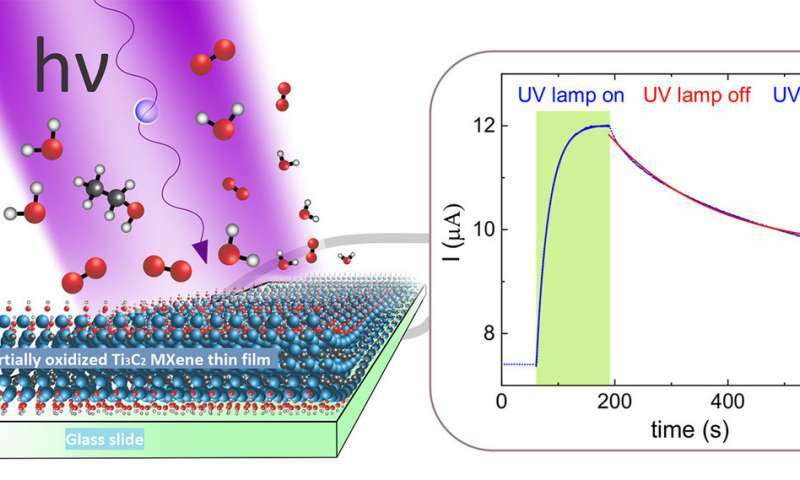 The difference our research sets forth, is that we discovered that these partially oxidized thin films responded significantly to UV light, and their photoresponse strongly depends on the atmosphere they are exposed to. This finding opens the door for many new applications of MXenes," concludes Mochalin. Since the discovery of MXenes in 2011, Mochalin has extensively researched the materials, especially their chemical and physical properties. Besides MXenes and other 2-D materials, Mochalin also works with nanodiamonds in interdisciplinary settings at Missouri S&T and extensively collaborates with international researchers and companies that are actively pursuing research and development of MXenes. Mochalin and Chertopalov plan to present the June paper results at upcoming chemistry, nanotechnology, and materials conferences. Their research was partially funded by a start-up grant from Missouri University of Science and Technology.